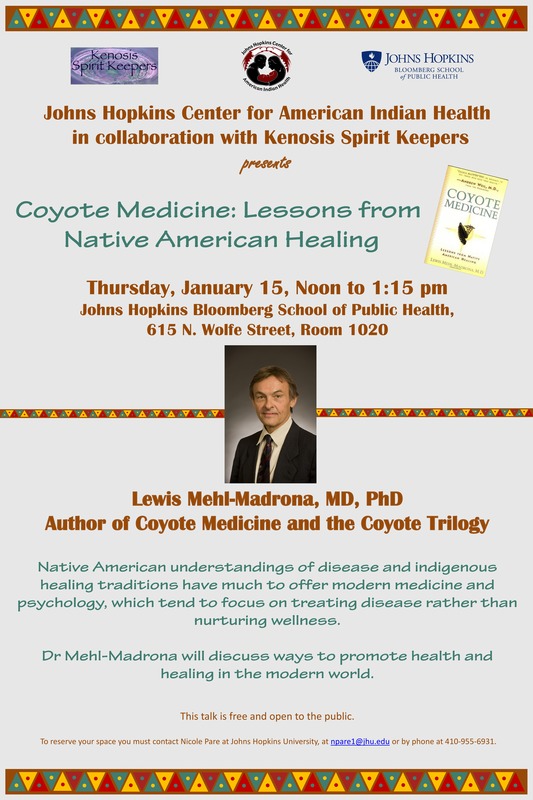 We are pleased to announce our special collaboration with Johns Hopkins Center for American Indian Health bringing Coyote Medicine with Lewis Mehl-Madrona, MD, PhD to Baltimore for a free public talk, January 15, 12 noon-1:15 p.m.
Dr. Mehl-Madrona, Lakota-Cherokee author of the Coyote Trilogy, will share about historical trauma, lessons about community healing and resilience that come from Native communities. Location: John Hopkins Bloomberg School of Public Health, 615 N. Wolfe Street, Room 1020. To reserve your space contact Nicole Pare, John Hopkins University, npare1@jhu.edu or phone 410-955-6931. With special thanks to Mike Weddle, MD, KSK Board Member, and Dr. Allison Barlow, Associate Director, John Hopkins Center for American Indian Health, in their efforts to make this event possible. Ton Akkermans has had a life-long interest in blacksmithing and lives in the Netherlands. Decades ago he had a memory of ancient Tibet where he made gongs and singing bowls. With this remembrance came the understanding of exactly how they were made in that long ago time and their use. The process was a prayerful one of deep intent—not casually hammered out—for the task he’d been given was a sacred one. Monks carried them as part of their spiritual journey, an ally for meditation, a way to release prayers through vibration when sounded. Sometimes they carried the same one all their years. It held the memory of their spiritual evolution. Present-day Ton makes the bowls and gongs in the old way and, along with wife Carolina, teaches others. 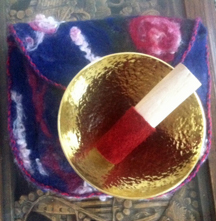 The bowls are imprinted with particular frequencies needed now, a vision toward global healing. But I knew none of this until my dear friend Hilary Bee, a spiritual teacher in the UK, sent me a note this past July. She reminded me of the beautiful bowl she’d shown me in February when she’d been in the US for a visit. She mentioned Ton’s work, that he’d empowered his students Gabriella Kapfer, Heather Smith Cowen and Quentin Cowen to help further his vision. Thus the Peace Bowl Project of Resounding Earth was founded with a mission, as Hilary told me: “…to make bowls as an offering to the Earth herself, to assist with ushering in a new era of peace and harmony, similar in concept to the Japanese Peace Pole project; and have these entrusted to bowl keepers in different parts of the world…” She said she’d been invited to go to Scotland in September as one of the seven who would make the first of the bowls. 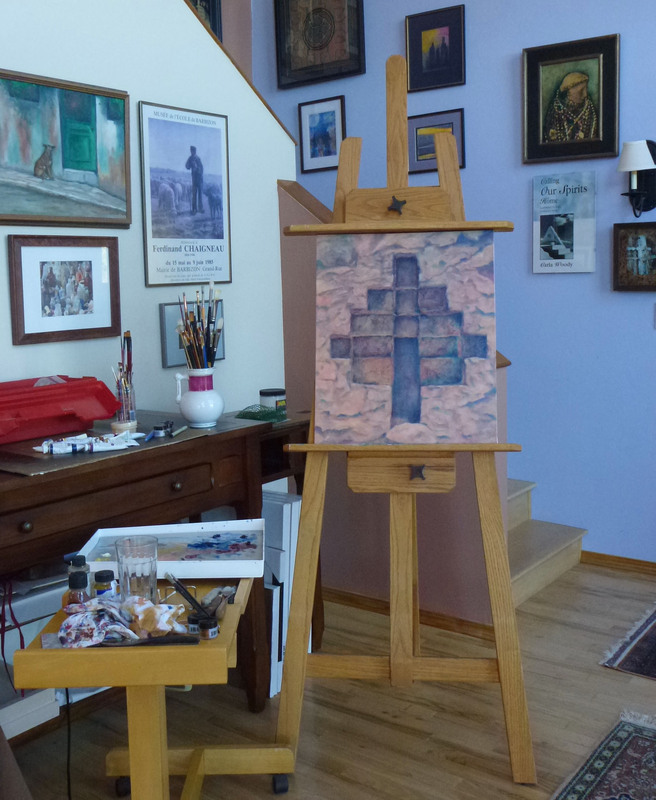 The European Sanctuary of the World Peace Prayer Society supported with the offering of their site. Then Hilary asked me to be a bowl carrier. She’d like to make the bowl for me, that my way of talking about the work I do—as a sacred container—was a clear sign to her. I realized in that moment what an honor she’d offered. But, truly, only later did I know to the extent. Of course, I agreed. She’d asked me to send something for her to tune into as she was making the bowl. After sitting with the request for a while, I put together a package with items representing the Indigenous peoples I’ve worked with most: a Hopi prayer feather I’d been given to carry, an image of Lake Najá with young Lacandón Maya men in their traditional dugout canoe, and huayruro seeds from Peru. 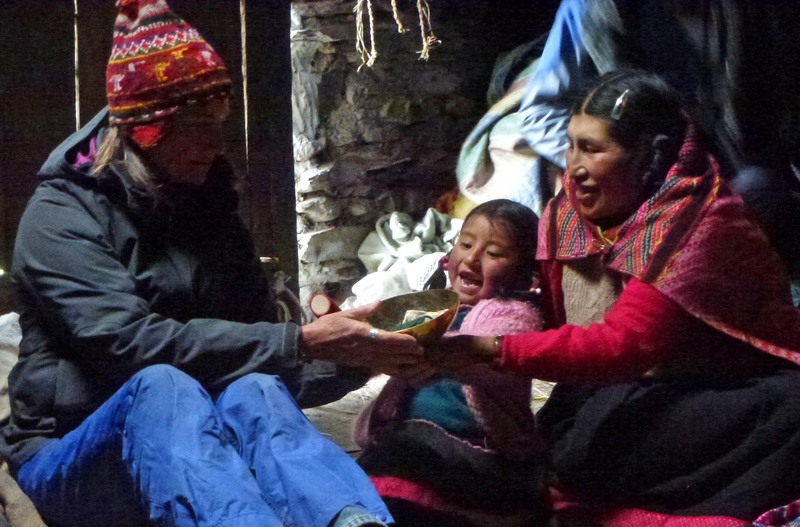 I intended to bring the singing bowl to Peru to be part of ceremonies there during our October-November journey in Cusco and Q’ero, and on to Bolivia where I was going afterwards. When I opened the package I’d received in the mail, the energy that issued from it literally took my breath. The bowl and its covering fairly shimmered in their beauty. Through a Skype conversation with Hilary, I learned how deep her own process was. Every indentation in its make-up was an inlaid prayer. There was a network of meditators holding with the intent of the bowls’ forming during that time. Several in Hilary’s teaching circle sent their own bowls along in support. And a young woman named Manuela hand-felted the carrier bag. Her daughter Mayaan made the trim while partner Mark carved the wooden button to close it. Folks across countries gave support. It was then I really began to understand the nature of bowl carrying and just how much had gone into the making. Our conversation was emotional. I knew that the bowl is not mine. It belongs to everyone. I sent out an invitation for people to send their prayers. They would be carried in the bowl and resonance released at each ceremony. A number of people responded. Upon my return I wrote to Hilary. The bowl was present at all ceremonies and circles, sounded separately by everyone, including each paq’o. 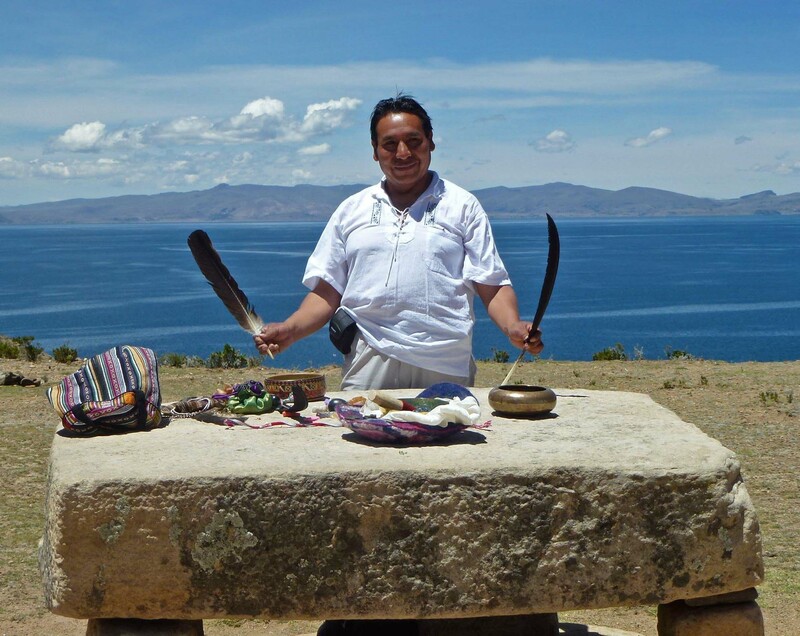 * After the formal group closed I went on to the Islands of the Sun and Moon with a few folks and a Quechua-Aymara paq’o [Hermógenes] …where at the Temple of the Virgins on the Island of the Moon…after an offering and sounding…I felt the Pachamama breathe beneath my feet. I’m quite sure it was in response. Despacho in Cusco for a safe journey up to Q’ero. During despacho ceremony in the home of my Q’ero friend Modesto in the village of Ccochamocco. Gi Thomas passes the singing bowl to Doña Carmina. I have never carried a mesa in the traditions of the Andes, even though I’ve been part of the teachings for twenty years. *** I don’t sing Native American songs or hold Maya fire ceremonies. I hold great reverence for Indigenous ways, but I’m sensitive to co-opting traditions that weren’t given to me, or that I have no concrete proof I was born or adopted into. My own lineage was hidden and lost to time. 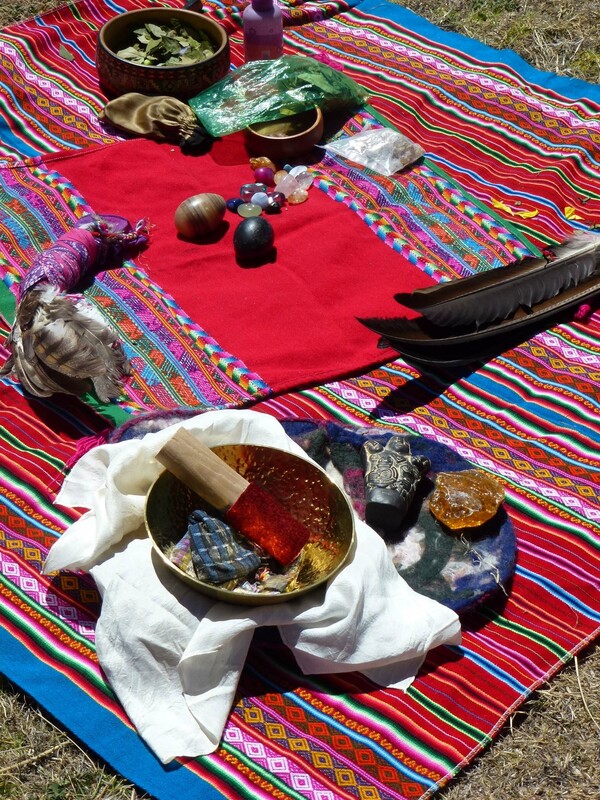 Altar offering at Puma Rock on the Island of the Sun with Hermógenes Romero Sanchez. 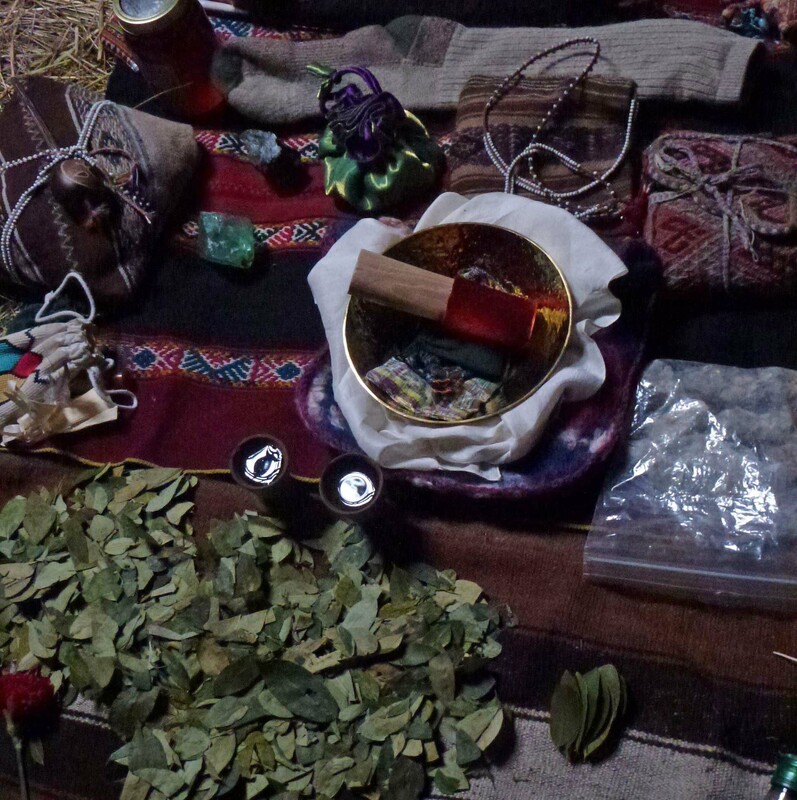 But in Bolivia Hermógenes began referring to the bundle I carried to each sacred site and placed on his mesa during offerings …as my mesa. And I realized that I do have a mesa. It was given to me, coming up through time, crossing cultures. And it carries a voluntary responsibility, perhaps one now made visible that I’ve felt for a very long time. This is my grounding. Offering at the Temple of the Virgins on the Island of the Moon. Anyone is invited to send prayers at any time. Just send them to me in a private email. The next journeys this singing bowl will make are to Mayalands in January and Hopilands in March, finishing the year with a return to Bolivia and Peru. But it’s always available and sounded during my own morning meditations. *Loosely translated, paq’o means shaman in Quechua. **Hopi Wisdom Keeper Harold Joseph was sponsored on this journey, an emissary of his religious leader on Shungopavi, to seek prayers from Q’ero spiritual leaders for the continuity of Hopi traditions. Harold stopped a number of areas along our journey, marking the path and laying prayers. 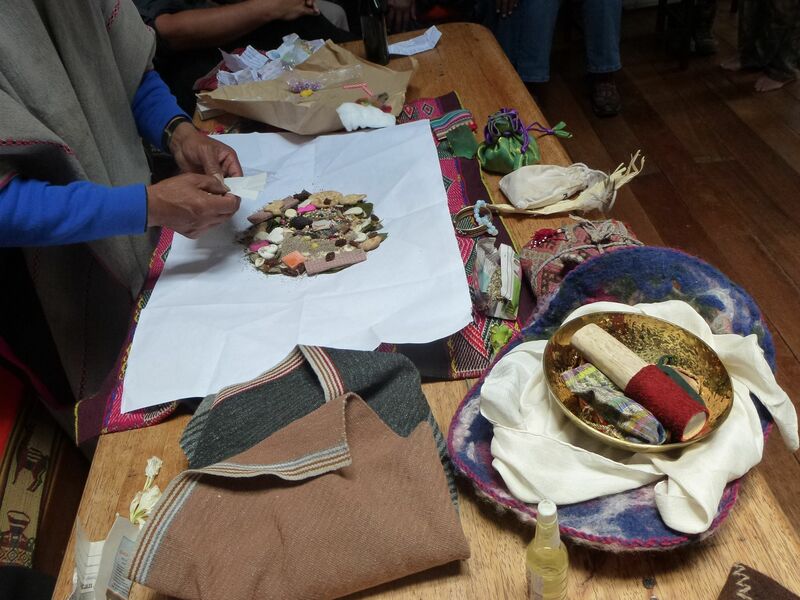 ***A mesa is the medicine bundle of a paq’o in the tradition of the Andes.